Recently, I made the switch from my old kettle, to a new variable temperature kettle. These kettles allow you to set the temperature of the water. So instead of letting it boil all the way, it will automatically stop at the temperature you need it to be at for the type of tea/herbal you’re making! Now you’re either thinking – wow this is great, or wow, can you get any lazier? To sum up my opinion on these kettles – steeping the perfect cup of tea has never been so easy! Anyways, this kettle has made a huge difference in my tea steeping experience. It’s so much easier to steep the perfect cup of green or white tea. With a regular kettle, it’s very difficult to estimate when your boiled water has cooled down enough so that it doesn’t burn delicate teas (including white and green) [for a reminder of what temperature your water should be at, click here]. I’m sure most loose leaf lovers have experienced a burnt tea, or a tea that didn’t taste right. Using a kettle with preset temperatures depending on the type of tea is fantastic! My white teas have never tasted so good! 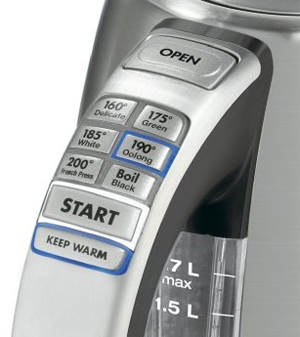 The kettle that I picked up is the Cuisinart CPK-17 PerfecTemp. It works great for me! There are also more pricey models that allow you to put the tea leaves right in. Eventually, I’ll probably get one of these too. These also make great gift ideas when you’re looking for a fancy gadget for a tea lover.